A new president will be elected Nov. 8, so I asked the students who they want to vote for, even if they can’t, on an online poll. Most students simply voted, while others left some not so positive feedback, but some comments were understandable. The anonymous comments, “Hillary is winning????. Don’t vote for a killer, and liar” and “Poll faker than Trump’s hair” addressed distaste for the two candidates, but other comments pointed out how the poll could be refreshed and you could vote again, which is true. 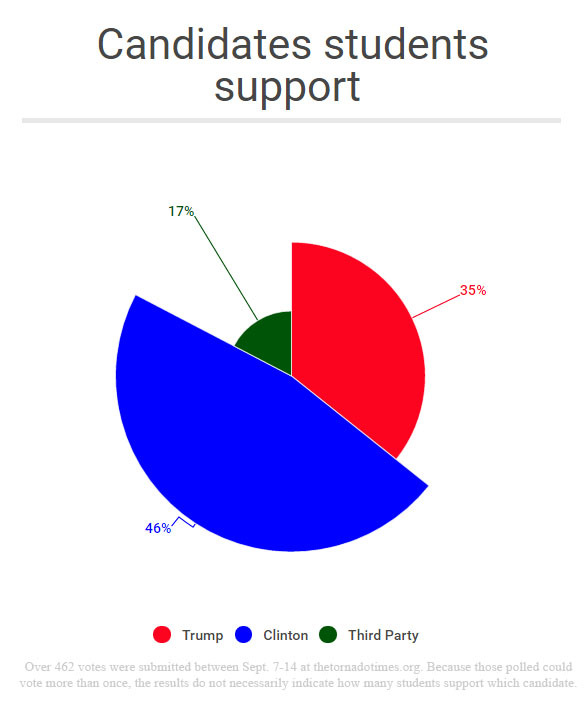 This poll has no scientific meaning, but does show the depth of support some have for their candidates. The third party isn’t just one alternate group: It is comprised of several groups like the Green Party, Libertarian Party and Constitution Party. Those parties don’t receive a whole lot of attention, but sometimes their nominees’ names, such as Jill Stein, are thrown around. Third parties do have an appeal in some elections, especially this election where people feel as if both candidates are horrible. According to the Real Clear Politics poll, Clinton is 41.2 percent favorable while Trump is only 37.2 percent favorable. But in a swing state like Florida, voting for a third party candidate gives your vote to the party you are likely avoiding voting for. For example, if I voted for Jill Stein because I didn’t like all of Clinton’s concepts and I for sure didn’t like Trump’s, then I would essentially be throwing away my vote or giving it to a candidate I don’t like. In states like California and Texas, voting third party isn’t a big deal because the state already has a majority of votes, but in Florida, where the votes are so close, voting third party might not be the best option. According to a poll by New York Times Upshot/Siena College Poll on Sept. 14, if the election were held that day, Clinton would win Florida 41 percent to 40. Third party candidates like Gary Johnson and Jill Stein have percents in the single digits. If I go and vote for Stein, who only had 2 percent voter support in that poll, my vote wouldn’t do much. On the other hand, if I gave my vote to Clinton or Trump, it could make a big difference because there is only a 1 percent difference between the two, with a 3.5 percent margin of error. My vote might just give Clinton or Trump the W in Florida. In swing states like Florida, voting within the two major political parties is essential. The concept of third parties is nice because they do provide more options for voters, but our current politics are built on the two-party system, and those parties will have the most power whether by money or by popular vote. If you do go vote this November, I encourage you to think about your vote wisely, and not waste that vote in order to achieve some joke of voting for a liar, a bigot or Deez Nuts. You should vote for the candidate that best supports your ideas and has the nation’s best interest in mind.